Maybe it's my German roots. I'm a big fan of well-made beers with that element of smoke. Call it a smoke beer here in the States, or a Rauchbier over in Germany. More technically correct to say in Bamberg, Germany where the Rauchbier style calls home. Schlenkerla is one of Bamberg's most well-known and broadly distributed breweries. I'm a fan of both bold smoke beers and those with subtle undercurrents of smoke. Put a plate of, say, roast turkey and mashed potatoes in front of me along with a glass of it and I'll be in heaven. Would have loved to find a Kentucky Hot Brown while in Louisville to eat alongside a glass of Schlenkerla. Wow, to think! But this is about a brewery that I "discovered" for the first time during the Craft Brewers Conference in Nashville, TN back in May. 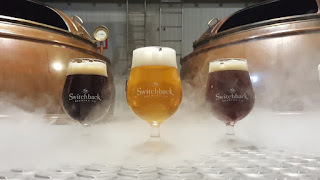 I'd received an e-mail from Switchback Brewing Company, located in Burlington, VT (ah, Burlington, it's been way too long, I must visit you again soon! ), informing me of the promotion taking place at City Tap and thinking/hoping I'd be interested to check it out. Little did they know (or maybe they did), they found the right guy. The brewery has something called Flynn On Fire Smoked Beer Initiative. They were serving three at City Tap that are currently in the series — Smoked Märzen; Blackstrap Ale; and Gates of Helles (great name, btw!). I did not sample the Blackstrap, so I cannot speak to that, but was mightily impressed with the easier-going Gates of Helles as well as the more assertive Smoked Märzen. Looking at the company website, the brewery also does other German-inspired styles (Kellerbier, Berliner Weisse, and Märzen to name a few) and they will obviously be on my to-do list when that next visit to the Granite State. They've expanding distribution into NYC earlier this year; hopefully Philly isn't too much longer. And, now that I'm on their media distribution list, I have this to pass along to you. Makes me wonder if the Flynn series, currently available in bombers, might someday also be available in cans. BURLINGTON, VT, July 26, 2018 — How does Vermont’s favorite beer improve on itself? By making it easier than ever to enjoy while adventuring. Switchback Brewing’s legendary Switchback Ale – a 100 percent unfiltered, 100 percent naturally carbonated, well-balanced reddish amber ale – is now available in popular 16oz cans. The 4x16oz packages are debuting now in Vermont and will roll out gradually to the rest of New England. "Switchback Ale drinkers are assured the same great beer flavor experience they expect from us," said Cherry. "There is zero compromise on quality. This beer is identical to our bottles and draught – which aren’t going away – and the fill is the best that exists on the planet. We’re excited to add more options in cans in the future."